Also known as: Angelic plant, Archangel, Holy Ghost plant, Garden angelica, Herb of angels, Angel's foot, Aunt jericho, St Michael's flower. An aromatic large leaved plant with small flowers yellowish or greenish in colour grouped together in large umbels. It may grow along roadsides and hedgerows. It is mainly the long thick fleshy roots that are used herbal remedies. The hollow stems are usually candied. It is said to be good for the treatment of indigestion and flatulence, coughs and nasal congestion and is reputed to increase the blood flow in the ams and legs making it a warming herb for those who feel the cold in winter. An old Fenland cure for pleurisy was to heat agelica leaves over hot embers and use as a hot poultice to the chest. According to legend Angelica was revealed in a dream by an angel as a cure for the plague. 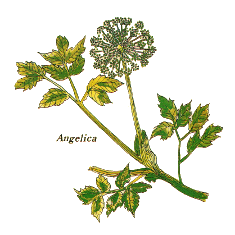 During the Great Plague of London angelica was chewed as protection. 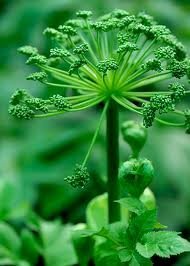 Laplanders used the leaves of the angelica plant to wrap and preserve fish and believed smoking it like tobacco could prolong life.